Apple has just released a new kind of beast, and its name is MacBook Pro Retina – in stores now! Apple’s new device sports a 13-inch display, but it has kept its predecessors design. No need to change something that ain’t broken, right?. Even though it feels familiar, it handles differently. This is due to the fact that Apple has changed the touch pad on their new device. The Force Touch Pad, which is complemented by a little, but complex, thing called Force Click, is based on Apple’s new technology called Taptic Engine. It produces a rather intriguing tactile feedback giving the user a better understanding of what’s happening on the screen, and how he can react to it. The 2015 version is faster, has a longer battery life, and a top notch display that is perfect for those lazy Sundays when you wish to binge watch the last season of House of Cards. It’s made from aluminium, and it’s a little bit heavier than the 2013 version, but not by much – from 3.46 pounds to 3.48, that is 1.56 kg to 1.57 kg for you metric folk – you can’t even sense the change in weight. The beautiful display stands out at 2560×1600, and its accompanied by a super comfortable keyboard that has just the right amount of spacing between its keys. Regarding ports, and sockets, Apple has decided to stick to its traditional values, and fortunately they didn’t add just one socket like they did with one of their new laptops called simply MacBook. The MacBook Pro Retina has two USB 3.0 connections, a HDMI port, two Thunderbolt 2 ports, a headphone jack, and of course an SD card slot. Unfortunately there is notUSB Type-C port – we can’t possibly find a logical reason behind Apple’s decision to not include a standardized port; it’s just mind boggling! The Force Touch Pad brings new features, but they feel lackluster! Apple’s wish is to innovate, but we can’t find any downside to the former touch pad to warrant a complete change. Users were immensely happy, and critics gave it overwhelmingly positive reviews. Why change it if you just released it and it’s top-notch? The Force Touch Pad isn’t awful, you can’t even call it mediocre, it’s actually a pretty great piece of technology, but there are some added features that just don’t make sense, from the utility point of view. You can fast forward at 60x the normal speed if you hard press down on the skip button in QuickTime, search for word definitions, or Wikipedia previews by using Force Click, and of course you can annotate in Mail and Preview. Third party app developers can also build features, and in the near future the store will most likely be filled with them, but until then you can just ponder – who in their right mind would like to hard press down on the skip button in QuickTime to fast forward at light speed? Has Apple received complaints about it? Or someone thought it would be a great idea just for the laughs and somehow it got through? Yeah, the search for word definitions feature by just using the touch pad seems great and all, but it takes about the same time as opening a new tab and typing the word in Google – it’s a feature planted just so you can praise that you have it? Taptic Engine can be a deal breaker to some! Now let’s tackle the Taptic Engine. It doesn’t feel right, and it doesn’t feel wrong – I know this is because I’m an avid laptop user, and I am most familiar with the 2013 touch pad, and what’s on the market at the moment. It can be a deal breaker to some that want to try it out in the Apple store, I know it because I felt a little bit of regret after buying it. If you’re a new user that has never played with a MacBook before you’ll have absolutely no problems with it. And the most frustrating thing about it is that the feeling just doesn’t go away – maybe after a month it’ll start to grow on me. Letting those issues aside for now, let’s talk about its capabilities. Apple uses Intel’s new fifth generation Core processors named Broadwell – God, I just love the name they picked. Apple’s new device will make you choose between Core i5 and i7 chips – but only dual cores. Intel will be releasing its new Broadwell quad cores this summer. When you talk about unbelievable writing, and reading speeds, Apple’s MacBook Pro Retina just puts its competition to shame, to utter shame. Their new PCIe-based SSDs are twice as fast as the first ones they ever used – and it can reach speeds of 1.6 GB/s and max sequential write speeds of 1.5 GB/s. I don’t think there’s a laptop on the market at the moment that can reach those speeds. Gaming wise, the MacBook was tested using the same game as the 2013 version. Batman: Arkham City scored 33 fps on the 2015 model – the 2013 model stands at 32 fps. Not a big difference at all. Regarding its battery life one can say that it stands firm on its positions – Apple has stated that it has a runtime of 12 hours. A test, that consists of looping a video, made by Dana Wollman of Engadget has set its life-time at 11 hours and 23 minutes. The 2013 version had passed the half day mark by an hour. It’s sad to see that even though new laptops come with new advanced technological capabilities, we don’t see any progress in battery life expectancy – give me a laptop that sports 2010’s technology and a battery that lasts me 24 hours and I will be a pleased individual. The standard 13-inch MacBook Pro Retina model starts at $1,299 with a 2.7GHz fifth-generation Intel Core i5 processor, Intel Iris Graphics 6100, 8GB of RAM and a 128GB PCIe-based solid-state drive. You can upgrade it to a 2.9GHz Core i5 processor for $100, or add $300 more for the 3.1GHz Core i7 CPU. You can also double the RAM to 16GB for $200. Also more options regarding the laptops storage space – choose from a 256GB model that will cost $1,499, and a 512GB SSD for $1,799. There is also a 1TB option for $500, but it’s only available for the $1,799 model as an upsell. Before ordering it on-line out of sheer impulse, take a look at what the competition has to offer you first. 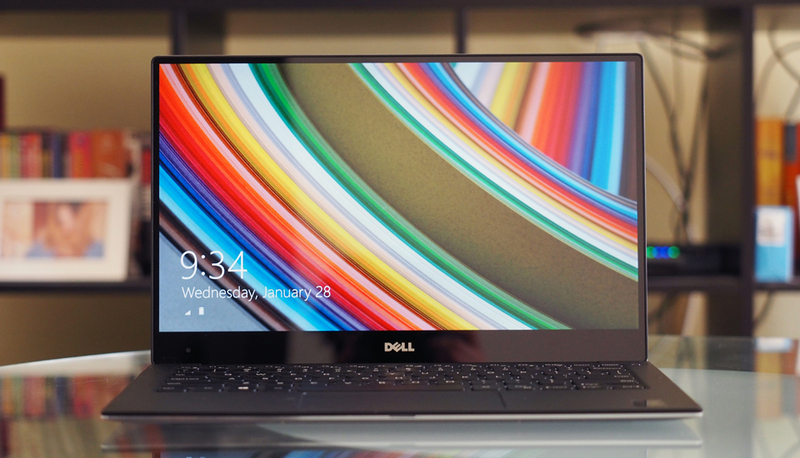 The Dell XPS 13 is a 13-inch display laptop that weighs about 2.6 pounds, that is 1.1 kg. On the edges you can find a Mini DisplayPort, a headphone jack, 2 USB 3.0 connections, a Kensington lock slot, and a full-sized SD card reader. The only thing that it doesn’t have is a HDMI socket. For some this might be a deal breaker. Also, the battery life consists of 8 measly hours. The standard model will cost you $800 and it consists of an Intel Core i3-5010U Broadwell processor, 4GB of RAM, a 128GB SSD, Intel HD 5500 Graphics and a matte 1920×1080 screen. There is a $1,300 model also that has a dual-core 2.2GHz Core i5-5200U CPU and 8GB of RAM, and a 3200×1800 screen. If you want their top of the line model you’ll need to cough up $1,900 – i7, double the RAM, more storage. The laptop starts at $900, and even though it has Hewlett-Packard’s brand written all over it, you should know that Microsoft’s Windows team was in tight collaboration with HP. It weights about 3.26 pounds, that is 1.47 kg and its casing consists of a unibody CNC-machined aluminium frame. 3 USB 3.0 connections, an HDMI socket, a Mini DisplayPort, an SD card slot, a headphone jack and a volume rocker – designed specifically for tablet mode. You also have the opportunity of buying Ethernet and HDMI-to-VGA adapters – they are $30 a piece. Its battery lasts up to 12 hours and 30 minutes – a lot more than Dell’s XPS 13, and slightly better than Apple’s MacBook Pro Retina. For $900, the entry level model consists of a Core i5-5200U processor, 4GB of RAM and a 1080p touch screen. This is the only version that can be upgraded. You can double the RAM for $50, add a Quad HD screen for $100, upgrade the processor to a dual-core i7 processor for $150, and even change the 128GB standard storage space for a 256GB, and 512GB disks – $50, to $200. The mid level model is $1,500 and comes with a 1920×1080 display. Of course, it’s more advanced, technically, than the $900 model. It consists of Core i7 CPU, 8GB of memory and 256GB of disk space. Now, if you want a higher resolution of 2560×1440, and a more storage, a 512GB SSD, while also sporting the same performance capabilities of its younger mid-level brother, you’ll need to cough up $1,400. Apple’s MacBook Pro Retina is indeed quite expensive when you compare it to potential contenders, but it offers quality over quantity. I’m not saying that Dell and HP don’t offer top-notch devices, I’m just saying that Apple is known to not cut corners when it’s about offering a high-performance device that will last you at least 10 years.